Beginning in 1978, the Pontiac group introduced a new special edition vehicle. The Firebird Formula LT Sport Edition which featured a revised 10% raised compression Chevy 305 V8 powertrain producing 155 hp (same as 1977 Chevy Monza Mirage) combined with a floor center console four-speed manual T-10 BW transmission coupled to a limited-slip differential final drive. The limited touring package (LT) also included a cabin roof, door, fender and hood graphics scheme, the Trans-Am sports handling package with HD gas shocks, modular alloy wheels and the SE Trans-Am rear deck spoiler with “Formula” word graphic detail. T-tops in 1978 transitioned from Hurst units to Fisher (GM) in mid year. The engineers also revised the compression ratio in the 400ci through the installation of different cylinder heads with smaller combustion chambers (1977 Pontiac 400 engines also had the 350 heads bolted to the 400 blocks, these heads were known as the 6x-4 heads and were taken from the Pontiac 350). This increased power by 10% for a total of 220 during the 1978–79 model years. The 400/403 options remained available until 1979, when the 400 CID engines were only available in the 4-speed transmission Trans Ams and Formulas (the engines had actually been stockpiled from 1978, when PMD had cut production of the engine). This example is one of the Gold editions and has been previously converted to RHD when it came to Australia many years ago. The current owner has had the dream of seeing it back on the road with gleaming Gold colour for some years and now it’s time for the Griffs team to bring that dream to reality after being a stalled project. The Pontiac arrived at Griffs mostly disasembled and with many boxes of parts. The right hand drive conversion has seen better days and is recieving some love with the addition of power rack and pinion steering. A complete new firewall has been fabricated and fitted by the Griffs team. The remainder of the RHD conversion will receive treament as the project progresses. The 403CI engine has been rebuilt some time ago so it will need some attention before the key turns and automatic transmission will need to be rebuilt or upgraded. Bodywork is well underway after the complete body and hang on panels have been garnet blasted where possible and the remaining paint stripped manually. Rust repairs have been started with the trunk area, both LH and RH lower inner and outer quarter sections and minor smaller spots here and there around the body. Keep watching as the project takes shape…………. The Impala became a separate series, adding a four-door hardtop and four-door sedan, to the two-door Sport Coupe and convertible. Sport Coupes featured a shortened roof line and wrap-over back window. The standard engine was an I6, while the base V8 was the carryover 283 cu in (4.6 L), at 185 hp (138 kW). Optional were a 283 cu in with 290 hp (220 kW) and 348 cu in (5.7 L) V8 up to 335 hp (250 kW). Standard were front and rear armrests, an electric clock, dual sliding sun visors, and crank-operated front vent windows. A contoured hooded instrument panel held deep-set gauges. A six-way power seat was a new option, as was “Speedminder”, for the driver to set a needle at a specific speed and a buzzer would sound if the pre-set was exceeded. The 1960 Impala models reinstated three round taillights on each side, and a white band running along the rear fenders. The available V8s were reduced to seven, in 283-cu in or 348-cu in displacements. The carbureted Turbo-Fire 283 cu in V8 could have either 170 or 230 hp (130 or 170 kW). The 348 cu in was available in 250 to 320 hp (190 to 240 kW) with a 350 hp (260 kW) Special Super Turbo-Thrust with triple two-barrel carburetors, 11.25:1 compression ratio, and dual exhausts. Fuel injection was no longer an option on full-size Chevrolets. New to the options list was speed and cruise control. Right-hand drive cars were made in Oshawa, Ontario, Canada, for New Zealand, Australia, and South Africa and assembled locally from CKD or SKD kits. The right-hand drive dashboard was a mirror image of the 1959 Chevrolet panel and shared with equivalent right-hand drive Pontiac models. Australian models were assembled by hand on the GMH Holden assembly lines. This particular example had previously undergone some restoration work in the home country USA and was later imported to Australia by its current owner. Having already had a healthy 383 stroker, 700R4 automatic transmission and other goodies implanted along with a nice standard interior, upgraded suspension and braking package it has all the bones for a cool ride. The journey so far has engaged the Griffs team to completely disassemble the vehicle to its bare shell which has been fitted to one of our rotisseries. The complete body and all panels have been garnet blasted where possible and the remaining paint stripped manually.This uncovered some previous older repairs that need to be addressed and also some rust repairs required. SO far the team has repaired rusted sections in both left hand and right hand A-pillars, complete floor section, requiring the use of some parts from the owner’s collection of donor parts, new rear floor repair sections as well as fabricating new sections as required. Work remaining is replacement of those huge rear quarter panels, wheel house repairs, outer sill panels, repairing the trunk floor area and various smaller repairs around the body. Next step will see the bodywork completed, final colour to be Roman Red with silver (final silver hue to be decided). From there it it is to be fulley reassembled and ready to hit the road! Keep watching for more progress………..
1965 Mustang LHD to RHD (right hand drive) Conversion. Driven into the Griffs workshop as left hand drive and is required to be completely converted to RHD with Victorian engineers report (VASS) completed, full Vic registration ready for the proud owner to drive home. As you can see from the pictures it has been disassembled, all parts converted to RHD include, firewall, dash, wipers and steering system. Ready for final bodywork and paint. The engine compartment will be completely repainted in satin black and dash in white as per factory. Also an upgrade to a complete heat and A/C system, engine bay dress up and replacement/repair of any items as required. Keep watching as we progress. Delivered to Griffs as a rolling body with driveline and suspension in place. Some body modifications have also been previously done, namely the side rear quarter vents have been removed, shock towers have been notched, subframe connectors fabricated/fitted, rear fuel fill moved to LH rear quarter panel and RHD conversion using new firewall, dash panel, upper/lower cowl panels with the upper cowl having the vent filled. Powered by a 390FE delivering the power via a C6 auto transmission through to an RRS rear Coil Over 3 Link Ford 9″ system. Complete RRS front coil over suspension and brake package whilst steering is also an RRS RHD power rack and pinion system. Also featured in the braking system is an RRS under dash brake booster and master cylinder system. The crew at Griffs have been asked to deliver the vehicle back to the owner as a running driving car ready for paint. To date we have finalised the placement of the engine, driveline and steering components and finished the engine mounts. A sweet set of custom headers have been fabricated along with a full exhaust system from front to rear using mandrel bends and all welds polished. A true work of art! Front ADR approved lap/sash retractable seat belts have been supplied and fitted with the retractor units being hidden in the rear quarter trim panels. A custom aluminium radiator complete twin thermo fan system has been given the job to cool the big block FE and the radiator support has been given the treatment to allow more air flow into the huge radiator. Kindigit Design door handles have been installed for a smooth door look but still having a practical way to open the doors. A Classic Auto Air custom heat/AC kit has been test fitted along with all dash bezels and trims. This is sure to be one cool custom 67 Fastback…………..
1954 F100 pick up delivered to Griffs for a revival and transplant of a healthy new 5.0 Coyote crate engine coupled to a Tremec T56 six speed manual through to an all new Ford 9″ rear end. Front suspension system is a complete IFS (independent front suspension) kit from Rodtech with power rack and pinion steering, 14″ Wilwood drilled and slotted rotors and 4 piston calipers to suit. Rear suspension will be parallel 4 bar with coil over shocks and Wilwood 12.19″ disc brake system to match the front. Rolling matter is taken care of by Coys C33 solids in satin black, 18 x 8 front and 18 x 9.5 rears with Pirelli rubber. The original chassis has been broken down to bare frame rails and boxing plates have been tacked in position and set up on our chassis fixture. The front suspension is sitting in place as is the rear tub, RH running board and RH front fender. Wheels and tyres are in place to set the final ride height, the rear of the chassis will have some mods to allow for the lower stance and suspension travel. As the new steering is RHD (right hand drive) we also need to carry out a RHD conversion to the original metal dash and firewall. Keep your eyes on this one, sure to be a crowd pleaser………………. Factory 1935-40 Ford chassis which will be boxed, HG Holden disc brake front suspension running P76 rotors with HQ Holden calipers and shortened commodore rack and pinion steering. Rear end is a shortened Ford 9″ running 3.7:1 Detroit centre with billet axles and Ford rear drum brakes. Engine is a 283 SBC coupled to a T5 5 speed gearbox with hydraulic throwout bearing clutch operation. 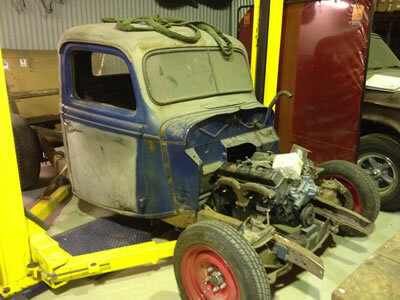 The body will be modified of course and the 37 cab has already has been channelled 3.5″, front sheetmetal will be 1935 Ford pickup and tub will be factory design narrowed to suit the rear end. Keep watching as we find time to work on it……….. Designed at a time when Studebaker’s truck line hadn’t seen major upgrading in over 10 years, the company, which had endured years of declining sales, was forced to use a number of existing components, but the result was impressive. The chassis and cargo box of the Champ were basically the same as what had been used for Studebaker’s ½ and ¾-ton trucks since 1949, but the cab section was very different. An entirely new cab was out of the question because of cost considerations, but the new Lark compact car’s body proved to be just the right size and shape to suit the purpose. The engineering staff took a four-door sedan, cut it in half behind the front doors and modified the front half slightly to fit the truck chassis. The only new sheetmetal stamping that was required was the back wall of the new cab. Minor modifications for mounting of the cab to the 1949-vintage truck frame were also made. The Lark’s front end sheetmetal was retained as well, but funds were allocated to give the Champ a new horizontal-bar grille that delivered a “tougher” look. From the start of production, those desiring V8 power could choose between Studebaker’s 259- and 289 in³ engines with either a two- or four-barrel carburettor. Both engines remained largely unchanged during the Champ’s production run. The LHD to RHD (right hand drive) conversion has been completed, we have used some parts from a donor Australian delivered RHD Champ which has worked out great. The project has now seen the install of a complete IFS (Independant front suspension) system with power rack and pinion steering and disc brake upgrade. This has allowed the stance of the Champ to take on a whole new look. In keeping with the theme we have also upgraded the rear suspension to a Ford 8″ assembly. The old 4 speed truck box has been thrown over the left shoulder to be replaced by a new T5 manual transmission complete with hydraulic clutch. We have adapted the T5 to the factory bellhousing and it was specially ordered with the front shift position to suit the factory champ floorpan and bench seat. 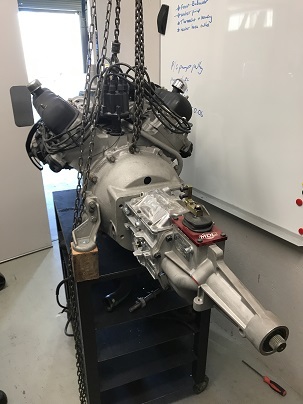 No doubt by far the most impressive upgrade has to be the addition of a factory 1957 Studebaker Hawk Supercharger kit to the engine, we were lucky enough to be put into contact with the right people to find these rare parts! The interior has been completely retrimmed in red/cream to match the exterior colours. We have also fabricated a custom hard tonneau cover from aluminium to cover up the cargo. As usual we will complete the Engineering (VASS) certificate as required and fully register the Champ. Stay tuned to see what happens next……….. Original all steel Ford three window coupe, never chopped or modified. It was a barn find from New York where it had been sitting for 25 years. The plans are for it to be powered by a 331 Hemi engine (minus the blower), Tremec TKO600 5 speed manual transmission and Ford 9 inch rear end with 3.7 gears. The finish product will a traditional 50’s 60’s hotrod with no billet or bling. Ford 9″ rear end is sitting in its position waiting for the rear suspension. Keep watching for more pictures as the project takes shape.